A recent report by the Lancet Commission on demention prevention released last week highlighted that more than a third of dementia cases might be avoided if aspects of lifestyle such as education, exercise, blood pressure and hearing were addressed. With approximately 45 million dementia sufferers in the world, there will be an estimated 1.2 million people living with dementia in England and Wales by 2040. Reporting on this topic, the national BBC News team selected Cactus Language Courses to highlight the importance of keeping your brain active throughout your life as one of the key ways of avoiding dementia. Learning a language gives your brain a ‘work-out’ and it has been recognised that keeping your mind active, throughout your life, plays a hugely important role in your overall health. 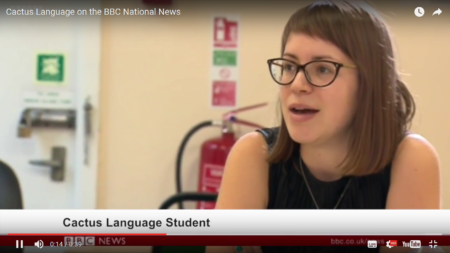 The BBC featured a Cactus Language Spanish class to demonstrate the learning environment and spoke to some of our students about the topic and the role that language learning plays in exercising your brain. If you are interested in joining a language class you can find out more about what happens behind the classroom door. To find out more information about evening language courses across the UK, or any of our language courses, or just general advice on language learning, simply call us on 01273 830 960 or email us. Our multilingual team will be happy to answer any questions you may have.